Line from the film: "How wonderful that the largest living structures on earth are built by tiny animals"
On its own, the ocean can be a breathtaking sight, and the South Pacific island of Fiji is a place where the sea is at its most majestic, a brilliant blue pool teeming with colorful tropical fish. But something is killing the island’s coral reef, threatening the thousands of species that call it home and the locals who count on it to feed their families. Coral Reef Adventure, a 2003 IMAX documentary, details the struggle to save this coral reef, and the dangers that those who dedicate their lives to protecting these natural wonders sometimes face. When Rusi Vulakoro, a deep-sea diver and native of Fiji, noticed the island’s coral reef was in trouble, he contacted researchers Howard and Michele Hall, both experienced underwater photographers, and asked for their help. Over the course of many months, the trio visited a number of locations around the globe (such as Australia’s Great Barrier Reef) in the hopes they might shed some light on the problem. Concluding that several factors were to blame for the reef’s demise, including nearby deforestation (which caused an increase in sediment) and a warming trend that’s been affecting bodies of water the world over, the group turns to Jean-Michel Cousteau, son of the famed Oceanographer Jacques Cousteau and a renowned scientist in his own right, to determine how best to revitalize Fiji’s Coral reef before it disappears forever. 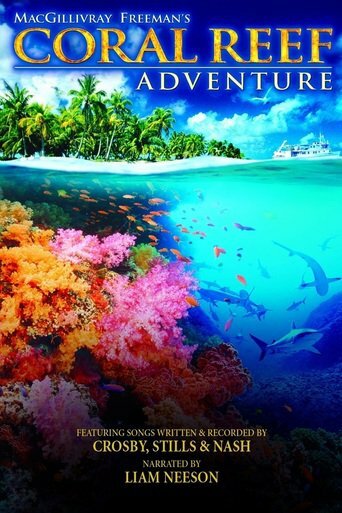 Featuring the startling imagery you’d expect to find in an IMAX movie, Coral Reef Adventure presents colors so vibrant that you’d think you were watching scenes from Pixar’s Finding Nemo. But nothing here is computer-generated; it’s alive, and thus even more amazing to behold. Yet what makes Coral Reef Adventure an engaging film isn’t its beauty, but the discoveries made during its underwater explorations (one particularly memorable sight is that of an octopus, searching for food along the dying reef), as well as the dangers the researchers face on a regular basis (aside from “the bends”, a sometimes fatal condition that affects deep-sea divers, the Howards and their team find themselves swept up in a current that dumps them into the middle of 300 Grey Reef Sharks). Yes, it’s a gorgeous motion picture, but its moments such as these that’ll stick with you well after the movie’s images fade from memory. The music of Crosby, Stills, and Nash (including hits like “Teach Your Children”, “Marrakesh Express”, and my favorite tune of theirs, “Southern Cross”) coupled with narration provided by both actor Liam Neeson and the principles themselves add quite a bit to the overall experience, but it’s the thrills to be found deep under the sea that puts the “adventure” in this film’s title.